1.Soak skewers in water 20 minutes. Prepare outdoor grill for direct grilling over medium heat. 2.In medium saucepot, add potatoes and cold water to cover by 2 inches; heat to boiling over high heat. Boil potatoes 5 minutes; drain and cool 5 minutes. 3.In medium bowl, toss steak and 2 teaspoons steak seasoning. In second medium bowl, toss mushrooms, bell pepper, zucchini, potatoes, oil and remaining 1 teaspoon steak seasoning. 4.Alternately thread beef and vegetables onto skewers. Place kabobs on hot grill rack; cover and cook 10 minutes or until internal temperature of steak reaches 135°F, turning kabobs occasionally. Internal temperature will rise to 145°F upon standing for medium-rare. 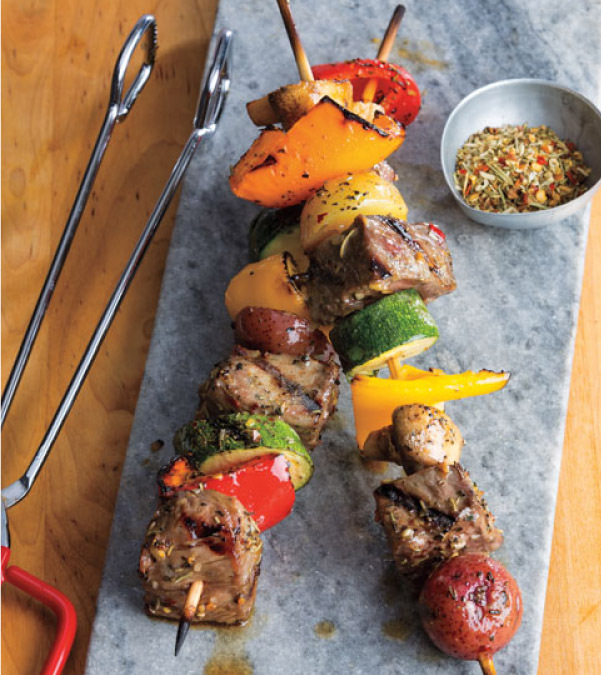 5.Transfer kabobs to serving plate; loosely cover with aluminum foil and let stand 5 minutes before serving.